A new matcha-flavored, chocolate bar in the BLACK THUNDER series, “Kyoto BLACK THUNDER” will go on sale from November 1st (Sun.) in the Kyoto area. The same bar will go on sale at a limited number of stores in the Osaka area from December. BLACK THUNDER is a popular chocolate bar series which stated sales in 1994 and has been on sale for over 20 years. The product development of this series’ newest bar which highlights the true flavor of matcha, was supervised by Biju Co. Ltd., famous for its Japanese confectionary series, “Kyoto Meika Otabe,” with a history of over 50 years. 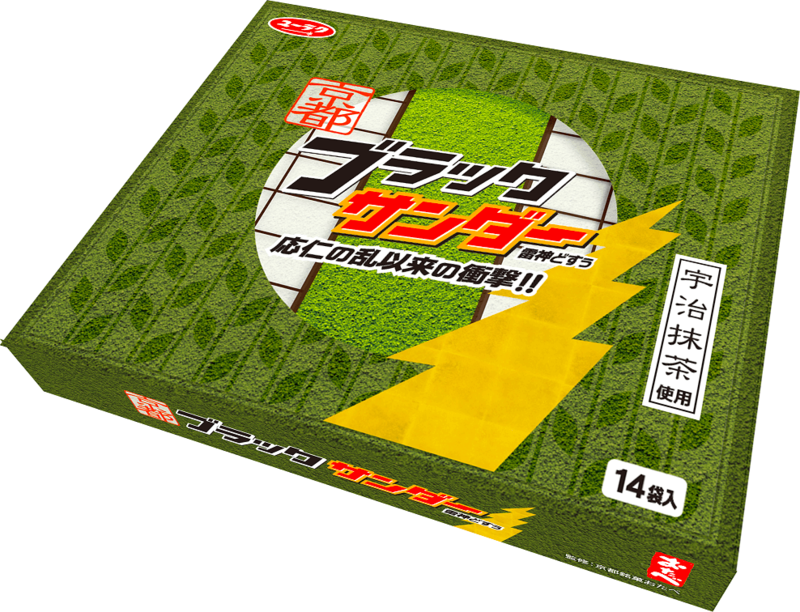 “Kyoto BLACK THUNDER” retains the popular crunchiness of this chocolate bar series and to this has added not matcha flavoring but 2 different powdered green teas, that is powdered uji matcha and powdered “sencha” (green tea). It is therefore, a chocolate bar where you can enjoy the true flavor of matcha. By using powdered sencha the slightly bitter aftertaste of green tea has been softened, making it a chocolate bar that can be enjoyed by both young and old alike. “Kyoto BKACK THUNDER” comes in 2 package sizes, that is in a size for the purchaser to enjoy and as a gift package suitable to be given as a gift from Kyoto. As a gift from Kyoto, or as a gift from Japan, “Kyoto BLACK THUNDER” makes for a perfect gift from your travels in Japan. Why not check out this brand new chocolate bar. Next » Introducing our first recommended matcha gift of the Reiwa era: The Matcha tiramisu sand -Yui-!